If you're thinking about buying or selling a practice and would like to speak to Dr. Wolff about the next steps, please submit your contact information. 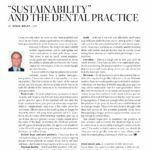 [Note – those of you who are readers of Dental Economics magazine will recognize Dr. Wolff’s November, 2013 article from that magazine. Click here to download a PDF. A recent series of potential seller conferences has again brought the issue of practice size to the surface. I always feel a little bad that I have to be the one to break the news to them that their life’s work may not be marketable to the next generation. I guess too that I am a little disappointed that it is such a shock to them since we have been preaching about this for the last several years. Attached is an article published in the Missouri Dental Associations Focus Magazine in early 2014. If there were any need to update our thoughts on this subject it would be that the floor continues to rise. The continually increasing student loan debt service means that more and more net income will be necessary to make ends meet. What Are You Going to Do After I Sell Your Dental Practice? ©2019 ADS MidAmerica Dental Practice Sales. Powered by the Get Noticed! Theme.